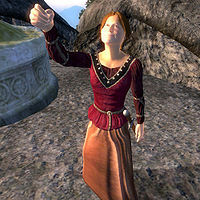 Blanche Mastien is a Breton commoner who is a devout worshipper of the Daedric prince Namira; ergo, she can be found with her fellow worshippers Hjolfrodi the Harrier and Degil at Namira's Shrine. Blanche lives her entire existence in the shadow of the Daedric prince and divides her time between sitting silently on one of the benches, placing an offering in front of the shrine, or preaching from behind the lectern. When not doing any of these activities, she simply wanders around. She wears a burgundy linen shirt, tan linens and a pair of rough leather shoes. She also carries an iron dagger along with a small amount of gold. If you speak to her before you start the Namira's Shrine quest she will say, "Don't talk to me. Talk to the one in the robes. ", referring to Hjolfrodi the Harrier, who you must speak to in order to summon Namira.